The term "tape" shall mean at least 4 inch wide, waterproof, retro-reflective material of the prescribed color and affixed at least 4 feet above mean high tide and giving 360 degree visibility. Between end marker poles, a series of at least 3 SINGLE BANDS OF WHITE TAPE placed equally distant from one another, but not more than 150 feet apart. The stake, pole or buoy furthest from the Maryland Shore – 3 BANDS OF RED TAPE and a RED TRIANGULAR FLAG at least 12 inches in length on each edge. The stake, pole or buoy furthest from the Virginia Shore – 3 BANDS OF GREEN TAPE and a GREEN SQUARE FLAG at least 12 inches in length on each edge. 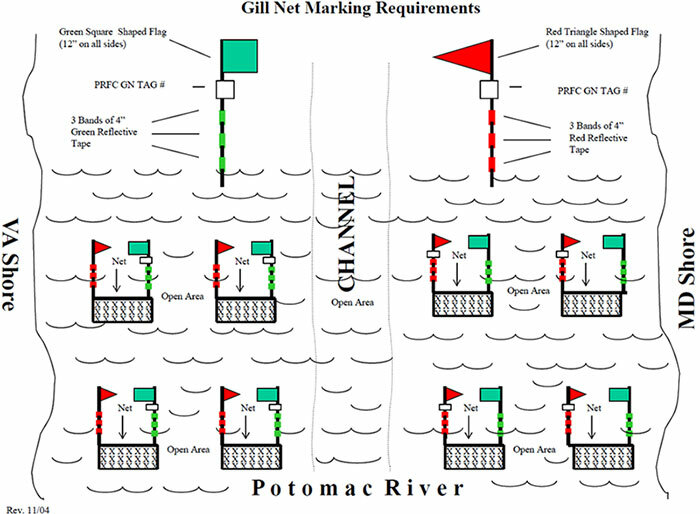 Note: These marking requirements complement the lateral aids to navigation system recognized by the U. S. Coast Guard and were adopted to assist the boating public in identifying and avoiding your nets. This pattern of tape will allow boaters to adhere to the "red right returning" rule.